In tonal languages like Thai, Vietnamese and Mandarin, a different tone can often completely change a word. But don’t we also have tones in English? Now, full disclosure: I do not speak a tonal language. This must have been immediately apparent to my readers, who pointed out that intonation in English or other western languages is not exactly the same as tones in tonal languages. 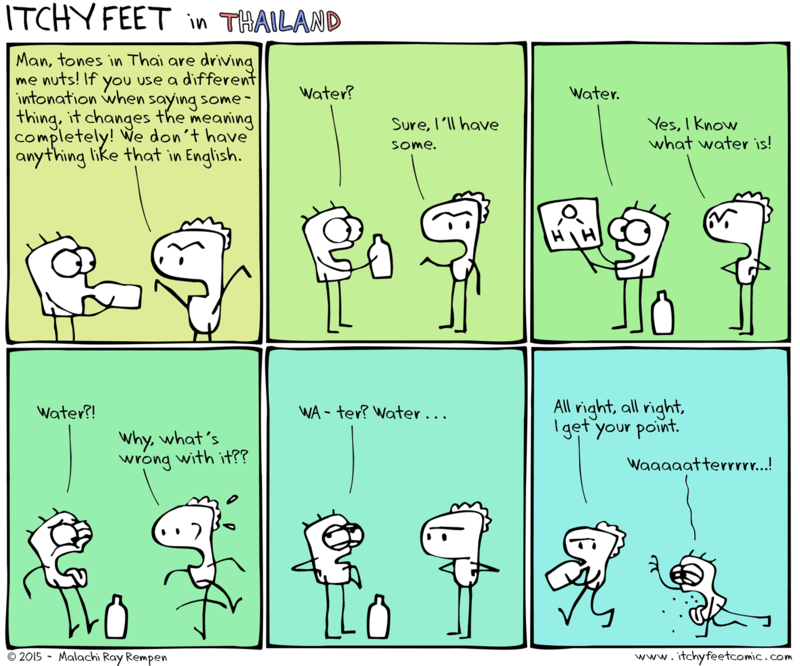 In the comic above, for example (inspired by stories my brother brings back from living in Bangkok), the various emphases in different places on the word in English contribute to giving the word a new meaning within the context of the sentence – “water?” being a question or offer, “water.” being a statement, “water? !” being an exclamation of disgust or surprise, etc, all recognizable based on what’s being said before and after, the expression on his face, and other contextual factors. That’s right. If you’re not careful with your tones in Vietnam, you might just well end up ordering the pineapple juice instead of the melon juice. How embarrassing! You can actually build a sentence with these words strung together: mā má mǎ mà ma?, or “mom is bothered by the horse’s scolding – yes?” Okay, so it doesn’t make much sense – but it contains all five Mandarin tones, in the order they’re usually learned, so it’s a handy tool to remember what the tones are. Others have pointed out that these are actually just words changing from verbs to nouns and vice versa, and that the meaning doesn’t always change that drastically: see áddict/addíct, cóstume/costúme, úpdate/updáte, etc (these are called “initial-stress-derived-nouns” if you’re interested to know). I think I fall on the side of the debate that strictly speaking, tonal languages are unique, and English is not one of them. However, in the comic he says “we don’t have anything like [tones] in English,” and with that I would disagree. Ask any native tonal-language speaker learning English, and they’ll agree that parsing a word’s meaning and the speaker’s intention just through the emphasis and tonal context of the sentence is nearly as difficult. What’s been your experience with tonal languages? Some readers mentioned Swedish as being a tonal language, is that true? Something tonal is in “family speaking”, when everyone in family knows what intonation of “mom” means what. The shorter is word, the easier it gets “tonalized”. intonation is super emotional in English. Think “cool.” in monotone vs a calm but appreciative “cool.” with aa little bit of a higher pitch at the end. do the same with “nice.” sarcasm relies heavily on pitch and tone to indicate whether you mean what you’re saying or not. by boyfriend is tone-deaf, and so we get into a lot of arguments that are entirely started because his tone is off by and i think he’s insulting me. i also think WASP families live in extremely high context subcultures within the low context US. almost nothing of importance is explicitly said, and emotions are very subtly displayed or suppressed entirely. It seems to me like your English examples are examples of accents rather than tones – more similar to a language like Spanish rather than Thai or Mandarin.